Composer Richard Rodgers and lyricist Lorenz Hart along with the multi-talented writer/producer/director George Abbott were the first to create an American musical based on Shakespeare. It was Rodgers’ idea to use Shakespeare as a basis for the show, and the success of the production was due to the quality acting and the witty dialogue and songs. 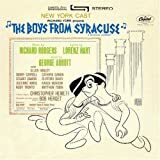 The 1938 Broadway show The Boys from Syracuse, which pivoted around the confused identities of two sets of twins in ancient Greece, was based on The Comedy of Errors. “Falling in Love with Love” was introduced by Muriel Angelus, a disillusioned wife of one of the twins, as she and her maids weave a tapestry. The original show ran for 235 performances. Hart’s younger brother, comic Teddy Hart, played one of the Dromios twins with Jimmy Savo, a comic who clearly resembled Teddy, playing the other. The musical has been revived many times, most recently in 2002. “Falling in Love with Love,” recorded by Frances Langford with Harry Sosnik and His Orchestra, charted in 1939 and reached number 18. The 1940 film starred Alan Jones (who sang “Falling in Love with Love”), Joe Penner, Rosemary Lane, and Martha Raye. Only three other songs from the Broadway show appeared in the movie: the clever “Sing for Your Supper,” “Oh, Diogenes,” and another song that would enter the standards repertoire, “This Can’t Be Love.” The songwriters wrote two new songs which were included in the film. And keep your hands out of romance. Helen Merrill recorded a lovely version of “Falling in Love with Love” with Clifford Brown. The song has continued in popularity over the decades with recordings by contemporary artists such as saxophonists Don Braden and Hank Crawford, guitarists Mark Elf and Vic Juris, vocalists Sheila Jordan and Kelley Johnson, bassist Ron McClure, organist Joey DeFrancesco, and pianists Ahmad Jamal, Eddie Higgins, Keith Jarrett, and Oliver Jones. Quincy Jones’ smart West Coast style arrangement for Clifford Brown’s 1953 Stockholm Sweetin’ album sets the tune up for some great solos, led off by baritone saxophonist Lars Gullin. Both Brownie and Art Farmer get turns at bat, as does alto saxophonist Arne Domnerus, trombonist Ake Persson, and pianist Bengt Hallberg. Alto saxophonist Julian “Cannonball” Adderley had the same strong feeling for the blues that Charlie Parker had, and it is certainly in evidence on his 1955 session with strings. Although Parker never recorded “Falling in Love with Love,” Cannonball’s version recalls Bird’s string orchestra sessions. After Clifford Brown’s untimely death in 1955, the spotlight fell on several other young trumpeters, one of whom was Kenny Dorham. His style reveals a thorough knowledge of not only Brown but also Dizzy Gillespie. A 1957 session included Sonny Rollins (tenor sax) and a first-class rhythm section of Hank Jones (piano), Oscar Pettiford (bass) and Max Roach (drums).